There is nothing particularly heroic in going with the crowd - is there? If in the street one finds masses of people moving in a certain direction, it is quite easy to move with them, just as a piece of driftwood easily floats down the river, carried along by the eddying current. What tries one's mettle is battling against the tide. It is the live fish that travel up the river; the dead fish go down with the stream. 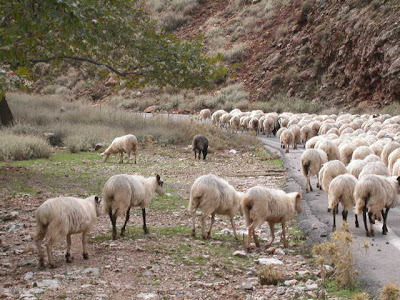 Some time ago a shepherd was slowly driving a flock of sheep along a country road. Just as they reached a bridge which spanned a river, running in a rocky ravine, something alarmed the whole flock. For a moment the sheep stood still in a state of panic; then one of the number, bolder than the rest, took a big jump, cleared the railing and disappeared. In a flash another had done the same thing, and another, and another, and another. The shepherd did all he could to stop them, but it was too late. Each sheep seemed to be suddenly possessed with the idea that it must be a right thing to do since everybody was doing it. Only a very few were restrained; and in a matter of seconds the rocks below were covered with dead and dying sheep. Not the biggest of crowds can make right the thing that is wrong. If you ignore your soul and its needs, you are wrong. If you shut God out of your life, if you treat Christ as a mere historic Personage of no particular interest to you, you are wrong. If you just live for your own pleasures, thrusting your sins into some dark corner of forgetfulness, you are wrong. And it is no valid excuse to say, "Oh! but everybody's doing it." And further, let us tell you this - NOT everybody is doing it. There is no case for which it can be said, "Everybody is doing it." Always there are exceptions. In this matter there are, thank God, a great many exceptions. The Gospel of Christ is being widely preached, and thousands are believing it. Heaven shall their blessed portion be. Yes, where will YOU spend eternity? To say that folks nowadays are not troubling their heads about such matters is no answer to the question. You will still have to spend eternity somewhere. When you die, you will not be like the beasts that perish; and because that is so, Christ has died for you. "There is one God, and one Mediator between God and men, the Man Christ Jesus, who gave Himself a ransom for all"
"Believe on the Lord Jesus Christ, and thou shalt be saved"
For the scripture saith, Whosoever believeth on him shall not be ashamed. For there is no difference between the Jew and the Greek: for the same Lord over all is rich unto all that call upon him. For whosoever shall call upon the name of the Lord shall be saved." What a thought provoking story! Not only is it a good gospel message, but it really makes one think about their present life and which direction they are moving, onward for Christ or being drawn downstream with the busy world. Those are really nice thoughts. Thanks for sharing! It gives me something to meditate on today (ok, not that I have nothing to think about, but it's good to have something deep to think about!). In my Sunday School Class of the 20 or so 2 to 5's years ago we learned all about sheep; what they ate, where they grazed, how they followed the shepherd while he protected them from danger and wolves. It's a wonderful subject thata little folks seen to understand. How grand that the Lord teaches us this way too. New Sidebar Link - Check it out!